Google is on a roll. Few weeks ago, Chrome had already surpassed IE to become world's most popular web browser and now this. According to official Android blog, Google Play Store has just hit the magic 25 billion downloads mark and to celebrate the occasion, Google is now offering a number of top Apps from Google Play Store for just 25 cents for the next 5 days. Google Play Store Hits 25 Billion Downloads! 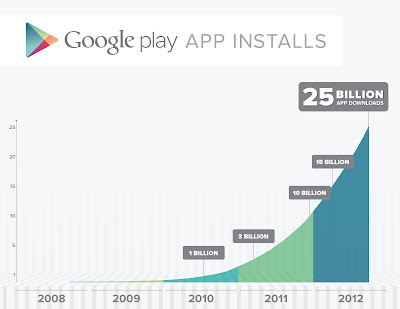 According to official Google statistics, Google Play Store has something like 675,000 apps and counting. And like the previous app sale which was kicked off when the number of downloads hit 10 billion mark, Google is now offering a wide range of apps for a pittance for the next five days. This is day 1 and there are a number of must-have apps on sale already. We will list the apps on sale for each day and will keep updating the post. So stay tuned.